Pretend you're one of the Weasleys. There's a fine line between magic and science, and Redditor tbornottb3 has created a beautiful example of this idea with the "Harry Potter-inspired Family Clock." It's a digital version of the Weasley family's fictional magical location device, which displays when individual family members are at home, work, school, hospital, prison or in mortal peril, among other options. The replica shows "home," "work," "holiday," "mortal peril," "forest" and "on the way." The creator used the If This Then That recipe-based automation service to define each of the clock positions for every family member. Most of it is based on smartphone GPS data -- for example, "work" means tbornottb3 is in the university library and "mortal peril" means the creator is near a rival school. The clock uses factors aside from location, too, like switching to "holiday" if the forecast calls for snow. All family members can assign unique factors to each of the clock's locations. It helps that the creator has some crafty friends who helped laser cut and etch the wood. 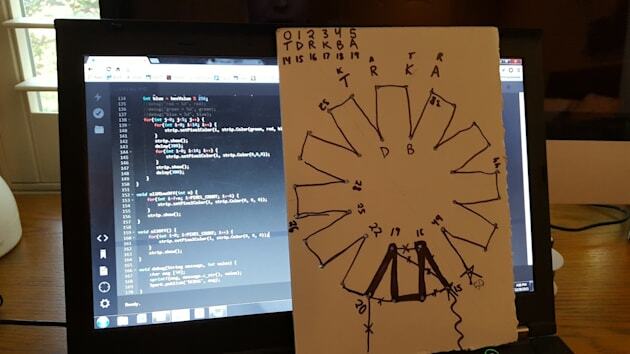 The clock's innards include a "Particle Photon connected via a breadboard to an addressable LED strip," and it all seems to involve a fair amount of coding. Finally, the space where the pendulum would usually hang displays the family's initial -- an ornate "B" -- and it's backlit with an LED that flashes a different color depending on which family member is about to get an update. This isn't the first DIY Weasley clock to hit the internet, but it's certainly the most intricate. In all, the clock took about three months to put together, tbornottb3 says. Not too shabby -- for a Muggle.